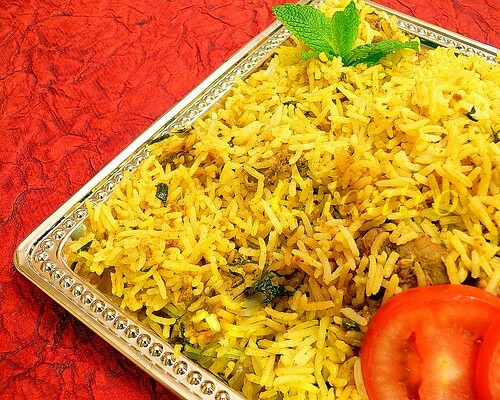 Biryani is a rice-based dish made with spices, rice (usually Basmati) and meat/vegetables . 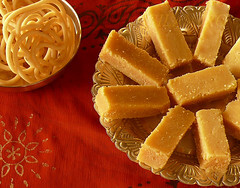 It is said to have originated from Persia and spread throughout the Middle East and South Asia by Muslim travelers and merchants, and is popular in India , Bangladesh, Iraq, Iran, Afghanistan, Pakistan and Srilanka. There are over 26 varieties of biryani made in India and almost every community today has its own version of the biryani. 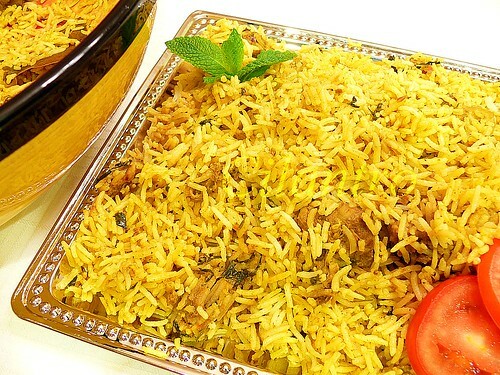 Memoni Biryani, Turkish Pilaf, Iranian Biryani, Lucknow (Awadhi) Biryani, Arcot Biryani and the very famous Hyderabadi Biryani. Hyderabadi Biryani and the delicacies that go with are the Mirchi ka Salan, Dhanshak and Baghare Baingan or a simple onion raitha. Having lived most part of my life in Hyderabad, my version of Hyderabad Biryani is a combination of different recipes from my Hyderabad friends thereby adapting the different techniques from most of them. Though it may look elaborate, it is relatively easy while preparing. 2 ½ teaspoon ginger garlic paste. Wash and clean the chicken. Marinate the chicken with the ground masala, ½ teaspoon ginger garlic paste and yogurt/curd and keep in the refrigerator for an hour. Soak the rice for 1/2 hour. In a large vessel bring water to boil, cook the rice until 3/4th done. Set aside and cool in a large baking pan which can hold the rice and chicken OR a cooking pot which could go in a oven if using an oven if using an oven in step No 6 . Use a large cooking pot if using a stove top for step No 6. In a heavy bottom vessel heat the oil and add the whole spices, then add the onion and saute until golden brown. To this add the ginger garlic paste and saute for about a minute. Grind the green chillies and tomatoes and add to the sauteed onions. Saute this well until the raw smell goes and oil starts to separate. Now add the chicken pieces and saute on high heat until the chicken starts to change color or the masala thickens. Add the finely chopped cilantro and saute well for few seconds. Slightly mix this chicken masala to the rice with salt( Do not mix very well). 1. Cover the rice and masala mixture and keep in a 425°F pre heated oven for about 15 minutes. After 15 minutes set the oven to warm OR 175°F and keep until served. Make sure not to burn the rice . 1. Take a flat Tawa/Dosai pan( cast iron pan) and put it on the stove at high heat , when it gets heated, put the cooking pot on the heated tawa. Simmer on low heat for about 15 minutes. Before serving, Carefully mix the rice with the chicken until it is all completely mixed. Serve warm. Garnish with finely chopped cilantro and mint leaves. Serve with Mirchi ka Salan, Dhanshak and Baghare Baingan or a simple onion raitha. TIPS: Adjust spice levels according to your preference. Oven and stove temperatures vary so set the temperature accordingly and be very careful not to burn the rice. After the 15 minutes, if the rice is not separate like the pic below then keep for another 10 to 15 minutes for the rice to absorb all the masala. The test for good Hyderabad Biryani according to experts: Take a palm-full of the Biryani and sprinkle it . If all the grains remain separate, then a good Biriyani is made. It means the rice does not stick. The Biryani should not be spicy but it should be fragrant. My favourite kind of biryan- - even better than the Lucknowi Dum Pukht kinds! Thanks for posting! Lovely clicks,wonderful biryani.I make this with raw mutton/chicken and i have one only blog. What a delightful color! very nicely presented! I am not a fussy eater, but biryani is my THE FAVORITE. I could eat everyday & a LOT. I did not know that there were 26 kinds! wish i could taste all of them;-) yours came out perfect, all the grains separate, which is probably the trickiest part of biryani. wow, its looking so yuumy and grt!! And grt pictures ...those are really looking like a "Shahi Biryani " on a King's table! looks great!! im gonna have to turn thig vegetarian.. but subsituting chicken with good old paneer! The color looks so vivid and the biryani looks tempting..great presentation! Biryani looks so good. I love your blog very much. Your family is very lucky to have you. The biriyani looks awesome. Loved the look of the rice grains! So fluffy! Mandira, Thank you and do try with paneer and let me know how it turned out. You could try with vegetables too. Thank you Radha for your lovely comments. Wow. Great Pic. Love the color scheme. :) my favorite type of biriyani. Just like my mom made it. wonderful presentation. looks so inviting. Everyone in our family loves briyani. Will def try this. 1. did u use any food colour,since d briyani looks yellowish?if so,wht color is tht? 2.izit fine if we mix d rice into the chicken masala instead of vice versa? My best wishes to you on your first attempt. 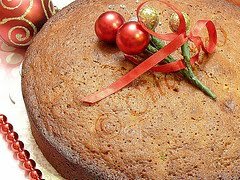 I have not used any food color, I have used the store bought turmeric powder and hence the color. I am not sure if any color is added in it. To your other question, you could do either way. im successfully made it in my 1st attempt itself!! :) it was awesome n so fragant!! I am glad that you made it and liked it as well. Thank you for your feedback. izzit i shud add some water whn cook the chicken masala?n use pressure cooker to cook it? I am not aware of where you live, the chicken what I get here in the US oozes out water while cooking and gets cooked before the masala thickens. That is not the case with the chicken cooked in India. Also the yogurt actually thins while sauteing and tends to cook the chicken while the masala thickens. You might want to cook it for some more time next time, maybe simmer on low heat for few more minutes. Add a little water if the masala has already thickened. I will not recommend pressure cooking the chicken for this type of Biryani. ohh ok thanx ya...im in chennai actually..! the masala was almost burnt at d bottom of the vessel which makes me to stop the cooking and proceed to next steps actually..! i will cook it in simmer nxt time.. Thanks for sharing such a graet info, it is really helpful to who looking for Best Biryani Restaurant in Hyderabad.